There’s been much hand-wringing lately over the future of big-screen movies, what with Netflix and other small-screen streaming services gobbling talent and eyeballs. The concern may seem overblown. Hollywood is enjoying near-record box office this summer, with hits like Avengers: Infinity War, Incredibles 2 and Mission: Impossible — Fallout suggesting there’s still life left in the traditional theatrical moviegoing experience. Outside of blockbusters and megaplexes, however, the outlook is less rosy. Smaller films and arthouses are struggling to hold onto audiences and attract new ones. 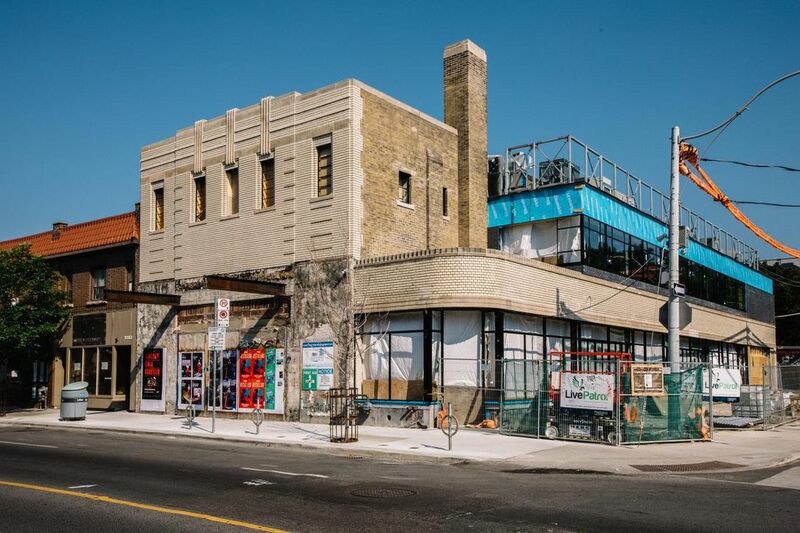 All of which makes the impending return of the single-screen Paradise Theatre in Toronto’s Bloorcourt Village neighbourhood both welcome and curious. The Paradise, a heritage building, has been closed since 2006. A victim of digital times — the DVD and other distractions — it barely escaped demolition. What do its revivers know that we don’t? The answer to that question points to a future of movie palaces becoming multi-purpose facilities, doing much more than just showing flickering images in the dark. 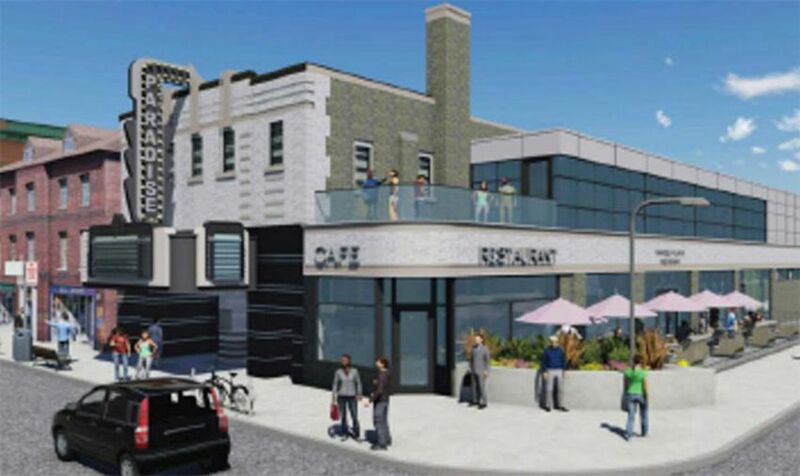 At the Paradise, this will includes several bars, a full-service restaurant and innovative programming that will include former TSN and Hockey Night in Canada sportscaster Dave Hodge talking about hockey with fans. There are also plans for a tribute night to the music of Kate Bush, curated by Carmen Elle, lead singer of Toronto synthpop band DIANA and former booker and manager of Less Bar on Bloor St. W.
More than 200 people packed two information sessions last Saturday at the Centre for Social Innovation on Bathurst St. to find out what’s in store in Paradise. For much of the 20th century, the business at 1006 Bloor St. W. was dedicated to showing film of some kind. The site on the north side of Bloor at Westmoreland Ave. has been used for movie exhibition since 1910, but the current building dates back to 1937. It operated as an Italian filmhouse from 1966 to the 1980s, then became the “Eve’s Paradise” adult theatre in 1986. It joined the Festival Cinemas chain in 1990, showing second-run and arthouse movies until finally giving up the ghost in 2006. The Paradise is scheduled to reopen this November, newly renovated and restored to its art-deco glamour. The lion’s share of the credit for this goes to Moray Tawse, a movie-loving mortgage mogul and winemaker who says he bought the Paradise because it reminds him of the old Biltmore Theatre Odeon on Weston Rd., which he practically lived in as a child. He told the info sessions he grew up in a poor family and one of his mother’s two jobs was at the Biltmore. He would tag along with her. Tawse, now in his early 60s, grew up loving films like Ben-Hur and the Road comedies of Bob Hope and Bing Crosby. But the Paradise revival is not backwards-looking, he told me in an interview. The days when a movie house could just be a movie house are rapidly fading. He actually thinks of it more as a “community hub” rather than a theatre. This was underlined by how most of the info session that I attended was devoted to the look of the Paradise, and also the plentiful food and drink offerings, rather than to the film programming, although the latter looks promising. Jessica Smith, the Paradise’s director of programming, says the 218-seat theatre (down from 400-plus seats in 2006) will run seven days a week showing critically approved second-run movies (Tawse calls it “the intellectual side of the marketplace”) and film classics (Casablanca, for example). The facility will also host film festivals, many of them in tune with the diverse ethnic makeup of the Bloorcourt neighbourhood. Smith also wants to program her own mini-fests, including ones devoted to movies made in Toronto, and she’s planning a weekly morning event called Babes in Paradise where parents of newborns can look after their offspring while enjoying a movie. Movies will be a priority when the Paradise reopens, Tawse said, but that could change as the facility finds its way and adapts to neighbourhood demand and interests. He admits he has no prior experience running a movie house but the two wineries he owns have given him a lot of experience in the food and beverage business. “I think we’re starting with the movie base and then we’ll move away from it as we see how the live music works, the comedy, the book clubs ... because you want to fill it,” he said. The rebirth of the Paradise seems in harmony with the ’hood: local activist and historian Ann Ball heaped praise upon Tawse and his team at the info session. So did local Councillor Ana Bailao, one of Toronto’s deputy mayors. She lives near the Paradise and says Tawse worked wonders not only in reviving the theatre, but allaying neighbours’ fears that they might be getting a noisy nightclub in their midst. Bailão assisted Tawse in getting the building permits while negotiating the political thickets that made prospective changes to a heritage building a difficult prospect. “This is true and special — a gift,” she says of the revived theatre. We’ll soon see if the reborn Paradise lives up to its name.